Sony's BZ-range is aimed at the corporate user, and the Sony VAIO VGN-BZ11MN (£615 inc. VAT) is an affordable, comfortable and attractive laptop. You'll ﬁnd similar styling aspects to those found on the more expensive VAIO models – such as the cylindrical hinge and green LED lighting – but ﬁnished in dark grey it's more conservative than consumer models. The 15.4-inch screen is impressive. It lacks the glossy Super-TFT coating found on many of its rivals – so it's a much better choice for those working on the move in direct sunlight. Colours proved equally vivid and lifelike, and this machine is just as good for watching movies or editing photographs on. As a corporate machine, it's no surprise to ﬁnd an integrated graphics card, as it uses less power and beneﬁts battery life. As a result, we managed to use the Sony for an outstanding 367 minutes away from a power point – noticeably more than any of its rivals. 3D performance is compromised, however, and those wanting to carry out intensive video editing or play games in their spare time should look elsewhere. The keyboard is a revelation, offering just the right amount of travel for comfortable touch-typing. It's also responsive and the keys move quietly. The touchpad is large, offering a simple and accurate way of navigating the Windows Vista Business operating system. Build quality is good, with magnesium-alloy used throughout, which adds a nice feel. The Sony looks like a machine that costs considerably more than its rivals. Our only gripe was the back of the screen, which ﬂexed under pressure. The 2.26GHz Intel Core 2 Duo processor is one of the more powerful among its peers, and, even with a modest 2048MB of memory, the BZ11 offers impressive multitasking capabilities. We found the system ran smoothly at all times, and applications opened with little lag. Storage space is minimal, however, with a 160GB hard drive. You'll be able to back up ﬁles to DVDs and CDs, and there's support for SD cards and Sony's Memory Stick format. A ﬁngerprint scanner protects your data, and also makes it easier to log in quickly. Networking features are comprehensive, with 802.11n Wi-Fi and Gigabit Ethernet, but those wanting to connect an external display will have to do so by the analogue-only VGA-out port. 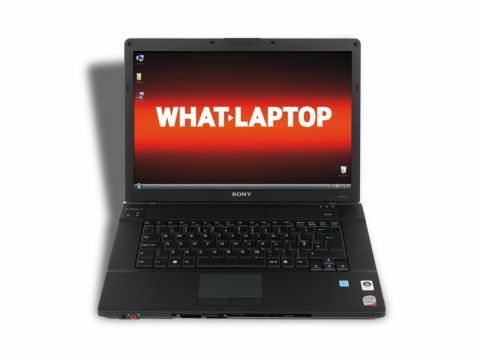 As a business machine, few laptops comes close to the Sony VAIO VGN-BZ11MN. Its impressive blend of performance, quality and excellent battery life make it a great choice for mobile users.